Bobcats are about twice the size of a domestic cat. They are abundant, but rarely seen. A homeowner set up a camera in his backyard and spotted a bobcat around 9:00 p.m. on his patio. 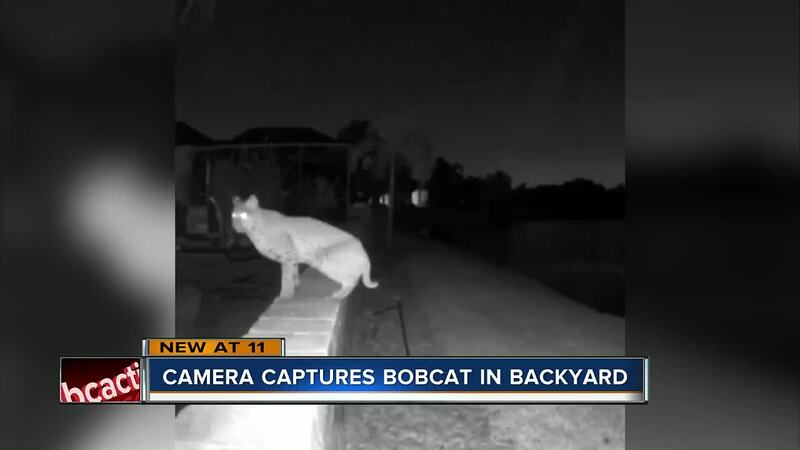 BRADENTON, FLA.- A Manatee County homeowner spotted a bobcat in his backyard. A camera in his patio caught video of the animal sitting on a ledge in his backyard. "They are very interesting animals. This is my "home run" video when I see that," said Lenny Besterman. The video was taken around 9:00 p.m. in the University Place subdivision in Bradenton. According to Florida Fish and Wildlife officials, bobcats are abundant, but people rarely see them. They are a native species, but FWC warns homeowners to keep pets on a leash and secure things like pet food and garbage. According to FWC, bobcats usually hunt at night, but seeing one during the day is not uncommon because they sleep for only 2 to 3 hours at a time. They prey on small animals such as rabbits, rodents, birds and occasionally deer. "If my dogs were out there at 9:00 at night that bobcat would have won that battle instantly. We wouldn't have ever known what happened," said Besterman. Besterman said his neighbors are being cautious keeping small pets inside. "They want nothing to do with us, but they do want our animals so we have to be careful and we're very cautious of that," said Besterman. Besterman runs a Facebook and Instagram page called "Sarasota Experience." He posted video of the bobcat on his social media sites. He also photographs sunsets, sunrises, backyard gators and wildlife living around us. "You'd be surprised on how many things you get to see in this beautiful area if you're paying attention and looking for it," said Besterman.